Halo 4 is the seventh installment in the Halo franchise for the Xbox 360. A teaser trailer shown at Microsoft's E3 Media Briefing on June 6, 2011 confirmed that Halo 4 was to be the first installment in the then-Reclaimer Trilogy. Set four and a half years after the events of Halo 3, Halo 4 continues the story of John-117 and Cortana left abandoned on the remains of the UNSC Forward Unto Dawn. The two survivors drift toward the mysterious world of Requiem and the ancient evil within. Halo 4 is the first game developed by 343 Industries, the management team in charge of the Halo franchise, and is published by Microsoft Studios; it was released worldwide on November 6, 2012. Upon the first day of release, Halo 4 grossed $220 million, surpassing Halo: Reach's record of $200 million, and $300 million in its opening week. Along with Halo: Combat Evolved Anniversary, Halo 2: Anniversary and Halo 3, Halo 4 was released on the Xbox One as part of Halo: The Master Chief Collection on November 11, 2014. A sequel, Halo 5: Guardians, was released for the Xbox One on October 27, 2015. "The Master Chief returns to battle an ancient evil bent on vengeance and annihilation. Shipwrecked on a mysterious world, faced with new enemies and deadly technology... the universe will never be the same." Halo 4 marks the return of John-117 as a playable protagonist after three Halo games focusing on different sets of characters. Having been lost in space for five years after the finale of Halo 3, John-117 and Cortana, adrift aboard the wreckage of the aft section of the UNSC frigate Forward Unto Dawn, find themselves near Requiem, the Forerunner shield world first glimpsed in the Legendary ending of Halo 3. The story of Halo 4 was described as being heavily focused on mystery, exploration and discovery, as well as being grand in scope and scale. Forerunner elements are featured extensively. The game also shows how humanity and the UNSC have adapted to the post-war world, particularly how they have co-opted Forerunner technology into their military devices and assets. Member species of the former Covenant return in the game, in the form of Jul 'Mdama's Covenant faction, consisting of Elites and most of their former subordinate species, including Grunts and Jackals, still loyal to the tenets of the Covenant religion. However, the Covenant are taking a backseat to an entirely new antagonist, the Prometheans, an elite class of Forerunner Warriors and their legendary leader known as the Didact; this new antagonist has been described as a "threat beyond anything that Master Chief has faced before." The subject of Cortana's ongoing rampancy, a year beyond her ideal functional lifespan, is also thoroughly and prominently detailed in Halo 4. Unlike Halo: Combat Evolved, Halo 4 was originally stated to have been designed to be part of a three-game arc from the beginning; however, the scope of the then-Reclaimer Trilogy (now known as the Reclaimer Saga) has since been expanded to encompass an undefined number of games. In addition, 343 Industries is aiming for more complete connectivity among all of their future media than that of the original trilogy; the Forerunner Saga and Kilo-Five Trilogy novels, and the Halo: Combat Evolved Anniversary terminals all have connections to Halo 4's story. The third and final Forerunner Saga novel, Silentium, was released on March 19th, 2013. Frank O'Connor noted that Silentium would be released after Halo 4 for "specific strategic reasons", likely referring to the connectivity of the game and the novel. A live action series, Halo 4: Forward Unto Dawn, provides a backstory for Thomas Lasky, a major character in the game; this series consists of five episodes totaling 75 minutes. The Halo 4 Collector's Edition includes a 90 minute extended cut of the series. Like Halo: Combat Evolved Anniversary, the Halo 4 campaign contains animated terminals accessible to the player. These depict the events of the Human-Forerunner War and Forerunner-Flood war from the perspective of the Ur-Didact and the Librarian, and chronicle his descent into madness. The wreckage of the Forward Unto Dawn floating in space. Halo 4 begins on July 21, 2557, four years, seven months and ten days after the armistice ending the Human-Covenant War. Cortana, laying silent for almost five years, notices that the ship's intruder alarms have activated and attempts to wake John-117 from cryo-sleep. Cortana notifies him that in his sleep, she rewrote the firmware of his MJOLNIR Mark VI armor, upgrading the HUD and armor capabilities. With alarms ringing and the intruders spreading to multiple decks, John slips Cortana's chip back into his neural interface and sets off to find the source of the disturbance. Suddenly, a Sangheili swordsman comes charging at the Spartan. After neutralizing the threat, John questions the AI construct on why his once-formidable allies have attacked them, to which she has no answer. After fighting the Sangheili and their "repatriated" Unggoy and Kig-Yar subordinates, John makes his way to the aft observation deck, viewing a large former Covenant fleet, led by Jul 'Mdama, surrounding the Forward Unto Dawn while multiple boarding crafts dock with the heavily damaged aft section of the frigate. John and Cortana subsequently make a crash-landing on the Forerunner world Requiem, entering the inner planetary shell via an entrance in the Dyson sphere-like superstructure. Recovering a Warthog, Master Chief and Cortana vow to make their way back to Earth in order to find a cure for Cortana's escalating Rampancy. They set out to find a way to contact the UNSC, circumventing the powerful jamming field surrounding the world. Fighting through numerous Jul's Covenant hunting parties, Master Chief is attacked by advanced Forerunner combat constructs which Cortana identifies as Prometheans. Evading or destroying pursuit, John attempts to warn the approaching UNSC Infinity of the dangerous artificially-induced gravity field that had caused the Forward Unto Dawn to crash. After disabling two control nodes, it becomes clear to John that a great threat had once been imprisoned within Requiem. The Didact, the Forerunners' greatest warrior, is released from suspended animation within a Cryptum. Easily disabling John with his powerful abilities, he declares the return of the Forerunners as the galaxy's rulers and saviors. Humanity remains weak and unworthy in his eyes of inheriting the Mantle of Responsibility, a view rejected by his wife, the Librarian. Having always revered the Forerunners as gods, the Jul's Covenant quickly swears alliance to the Didact and his Prometheans. The Didact views the Covenant as mere "primitives", but permits them to serve his cause, to prevent the ascension of the human race to galactic prominence. Narrowly escaping the collapsing core facility, the Chief and Cortana return to the planet's surface only to find their warning to the Infinity came too late. The warship crashes more than 70 kilometers away, with a massive force of Covenant and Prometheans closing on their position. Evading capture, John is successful in regrouping with a group of SPARTAN-IVs and Marines led by Commander Thomas Lasky. Recognizing the Chief immediately, Lasky asks John and Cortana to clear a landing zone so that Infinity's ground forces can fall back to the ship which has fallen under siege. Commandeering a Scorpion tank, John leads the attack to the crippled vessel alongside Commander Sarah Palmer's Spartans. Using the UNSC's latest weapon, the Mantis exoskeleton, John rallies a force of nearby Marines and regains control of the ship's interior. After reinitializing the secondary MAC guns and missile batteries, the tide turns in the UNSC's favor. Two light cruisers and dozens of dropships are destroyed in the artillery barrage, while the Didact's Cryptum is forced to retreat. With a momentary lull in the fighting, John is called to a strategy meeting with Andrew Del Rio, Captain of the Infinity. Skeptical of the threat of the Prometheans, Rio orders an immediate attack on a Forerunner gravity well generator preventing the ship from leaving. A strike force of Spartans led by John is deployed along with a Mammoth ultra-heavy ground vehicle supporting the attack. Facing daunting odds, the UNSC is able to defeat a large armored strike force of Covenant and Prometheans and they disable the gravity beam. Before reaching his objective, John is confronted with a vision from the deceased Librarian, who warns him of the Didact's true plans. John-117 meets the essence of the Librarian. In ancient times, the human race was once a great interstellar empire. Fleeing from the Flood and destroying any world tainted with their presence, they came into contact with the Forerunner ecumene. Ignoring their warnings about the dangers posed by the parasite, the Forerunner warriors led by the Didact defeated and imprisoned humanity upon their homeworld. Weakened by the struggle, the Forerunners were easy prey for the resurgent Flood. Defying the Forerunners' decision to accept the Halo Array as their final resort, the Didact used a device known as the Composer, capable of transferring organic consciousness to software format, to convert his warriors into mechanical Promethean Knights, in order to combat the Flood (which could only infect living tissue) more effectively and without risk of infection. Lacking the sufficient numbers to turn the tide, the Didact used the Composer to "conscript" a large population of humans into his army, leading to the confiscation of the Composer and his imprisonment on Requiem. Opposing the Didact for her own reasons, the Librarian provides John with a gift: a medical treatment to counteract the Forerunner's devolution of the human genome, and a means to resist the effects of the Composer, with which the Didact plans to enslave the human race once again. Regrouping aboard the Infinity, Captain Del Rio dismisses the threat of the Prometheans and prepares the ship to depart the system. Defying direct orders, John takes the increasingly unstable Cortana and departs the Infinity. Armed with a Pelican gunship provided by Commander Lasky, John launches several attacks on support pillars providing the Didact's Cryptum with shields and power, with the goal of preventing him from leaving the planet and attacking Earth. The Composer fires on New Phoenix. This attempt ultimately proves unsuccessful, as the Didact leaves Requiem aboard his massive vessel, the Mantle's Approach, escorted by a flotilla of Covenant ships. Stowing away aboard a Lich, Master Chief pursues the Forerunner to Ivanoff Station, a UNSC research base orbiting Halo Installation 03 where the Composer is kept. Dr. Sandra Tillson, a lead researcher aboard the base, helps guide John to the artifact amidst a swarm of Covenant attackers. Despite reaching the artifact first, the Didact is successful in obtaining the Composer, tearing it out of the station's hull with a gravity beam. Testing the weapon, the Composer burns the crew of the station to ash, harvesting their essences to power additional Prometheans. The Master Chief survives, thanks to the genetic enhancements provided by the Librarian. With the Composer in the Didact's possession, the Forerunner is poised to deal a deathblow to the UNSC, and by extension humanity. Racing back to Earth aboard a Broadsword fighter stowed on the outer hull of the Didact's ship, the Master Chief finds the Infinity and a UNSC battlegroup waiting for him. Flying below the Forerunner vessel's shields, John is able to destroy the ship's point defense guns, allowing Infinity to bombard its hull. Entering through a breach in the armor, John fights his way to the Didact's location. Despite their best efforts, the Didact is able to fire the Composer at Earth, North America. Armed with a HAVOK portable nuclear device, John confronts the Didact once again. While John is no match for the Forerunner's powerful abilities, Cortana, nearing the end of her life, immobilizes the Didact with hard light shackles. With the last of his strength, John defeats the Didact with a pulse grenade, sending him falling into a slipspace rupture beneath the Composer, and detonates the nuclear bomb manually. The Master Chief and Cortana meet for the last time. With the last of her power, Cortana is able to teleport John away from the vessel before it was destroyed and meets with John for one last time inside a bubble of hard light. Overcome with emotion, John remarks that he was supposed to have protected her. Cortana insists that they were supposed to protect each other, and did. Using her hard light body, Cortana is able to actually touch John for the first time, which she says that she's been waiting to do for a very long time. Smiling and seeming at peace, Cortana welcomes John home, and then fades away completely. The Master Chief drifts in space amidst the debris of the Didact's ship for a time before being recovered by a UNSC search-and-rescue team. Later, John speaks with (now Captain) Lasky about the loss of his closest friend and companion. In the battle's aftermath, a UNSC team investigates the city of New Phoenix, where the Composer's energy beam was directed; although the infrastructure of vehicles and buildings are completely untouched, its former human inhabitants are gone. Aboard the Infinity, John rejoins Palmer and the other Spartans, preparing for their inevitable next battle, and his MJOLNIR Mark VI armor is removed for the first time in years. The final scene is overlaid with a speech given by the Didact to his fellow Forerunners, after being accused of attempting to wipe out human life. In this speech, the Didact maintains his belief that only the Forerunners are worthy of the Mantle and that humanity should never be allowed to reclaim the Forerunners' accomplishments. While their defeat at Earth proved a setback for the Didact's Prometheans and Jul's Covenant, it did not result in their defeat. Months later, the Infinity returns to Requiem with a complement of Spartans, determined to claim the planet. This tour forms the background for the Requiem Campaign covered in the Spartan Ops mode. The campaign of Halo 4 consists of 10 levels, of which 8 are playable. Dawn - "After four years adrift in space, Cortana awakens the Master Chief to investigate a disturbance on the Forward Unto Dawn." Requiem - "Having survived the destruction of the Dawn, Master Chief and Cortana search for a way off of the mysterious Forerunner planet." Forerunner - "Master Chief tracks the Infinity's signal to Requiem's core in the hopes of returning Cortana to Earth to address her rampancy." Infinity - "Following the Didact to Infinity's crash site, Chief and Cortana descend into the surrounding swamp to rescue UNSC survivors." Reclaimer - "Infinity sends the Master Chief and Gypsy Company to neutralize the gravity well keeping them on Requiem." Shutdown - "As Infinity flees Requiem and Cortana's rampancy worsens, Master Chief struggles to stop Didact from pursuing the Composer." Composer - "The Master Chief's pursuit of the Didact leads him to a UNSC science station orbiting Installation 03." Midnight - "With the Composer in the Didact's possession, Chief and Cortana must destroy the device before he turns it on his next target." Please visit Spartan Ops and Halo 4 Terminals for the dedicated appearance lists of said modes. A first-person view of Halo 4's multiplayer. Halo 4 was developed for the Xbox 360 console. The game's creative team, which comprised nearly 200 individuals who developed the game for nearly three years, was led by creative director Josh Holmes. The game has been stated to continue the Halo series' tradition of inspiring wonder in the player while providing engaging, visceral gameplay. The game utilizes much of the "sandbox" that has been featured across all six prior Halo games and other media, in addition to introducing new characters, weapons, vehicles, and other elements. The game's "sandbox" and overall style are meant to be evocative of Halo: Combat Evolved moreso than of later installments. Dual wielding is not accessible in the game. During production, Halo 4 was given the codename "Halo Onyx". The narrative design team of Halo 4 was headed by Armando Troisi, who previously worked on Mass Effect and its sequel, along with an in-house team of writers. The original draft of the Halo 4 script was written by Chris Schlerf, who has also had major influence on the script since then. Brian Reed, who wrote the 2010-2012 graphic novel adaptation Halo: Fall of Reach, was also part of the writing team and made significant contributions on the story. The art director for Halo 4 was Kenneth Scott. He described the visual style of Halo 4 as being more ingrained in the expanded universe fiction, and more "mature" than before. With the game's increased focus on the Forerunners, the artists invested heavily on the look and feel of Forerunner technology, including the incorporation of more "active" Forerunner technology as opposed to the mostly inert and abandoned structures seen in the earlier games. John-117's experience and the player's experience are meant to be intertwined, with the Master Chief essentially serving as the player's avatar within the Halo universe. John's character is explored and developed in more depth than in the prior games, and the relationship between John and Cortana is heavily featured and expanded. Halo 4 also features more athleticism, as the background of Master Chief and the Spartan supersoldiers in general promise a feeling of "a super hero", a feeling 343 Industries wanted to convey to the player. As with many other art assets, the Halo 4 art team redesigned the Master Chief's iconic MJOLNIR armor from the ground up. The first look into the redefined armor, which differs considerably from the suit seen in Halo 3, was seen in the announcement trailer, generating a considerable amount of confusion and speculation among fans. 343 Industries later stated that the design seen in the trailer was not the final version. The final iteration was later seen alongside the first Halo 4 gameplay reveal following Microsoft Spring Showcase 2012. The changes in the design are mostly cosmetic and were made with the intent of giving the suit a more functional look in order to suit the new art direction of the game. In a fictional context, the difference in the suit's appearance is explained by an extensive overhaul performed by Cortana while John was in cryo-sleep. Motion capture, first implemented in the series on Halo: Reach, was used during the production of Halo 4. Recording began prior to the release of the Making Halo 4: First Look video in Los Angeles, California, with material for the character Cortana and a man playing an unidentified character filmed; recordings were done as recently as the week of April 29, 2012. Bruce Thomas and Mackenzie Mason would later be confirmed as the cinematic performance capture actors for John-117 and Cortana, respectively. While most cutscenes in the game are rendered in real-time in the game engine, Halo 4 is the second game in the series (along with Halo Wars) to use pre-rendered cinematics. Except for Spartan Ops, three scenes from the game (along with the introduction of the Infinity mode) were computer animation produced by Digic Pictures and one scene produced by Sequence. At a London press event for Halo 4, it was announced that development of the game was completed on September 25, 2012 after three years in development. The finished product was then sent to "various certification processes" before mass production of the game began. Coincidentally, the September 25 completion date of Halo 4 also marks the fifth anniversary of the North American release of its predecessor, Halo 3. Sotaro Tojima, best known for his work on Konami's Castlevania: Circle of the Moon and Metal Gear Solid 4: Guns of the Patriots, served as Halo 4's audio director. The team has performed many live audio recording sessions, several of which occurred in Tasmania, Australia. Some of these recording sessions took place in generally inhospitable environments, such as underwater, in fire, and in ice, through the use of specially designed microphones; other recording sessions utilized "homemade" explosives. Tojima intended for the game's audio to be clearly grounded in the Halo universe, though to also have a more realistic quality than in past titles. A video was released on February 23rd depicting 343i recording weapon and explosion audio alongside the U.S. Army Special Forces. Weapons such as the M4 carbine, Mk 17 battle rifle, M240 general purpose machine gun, M107 sniper rifle, M2 heavy machine gun, and M72 rocket launcher were used in the recording. Several voice actors from previous media reprised their roles in the game. 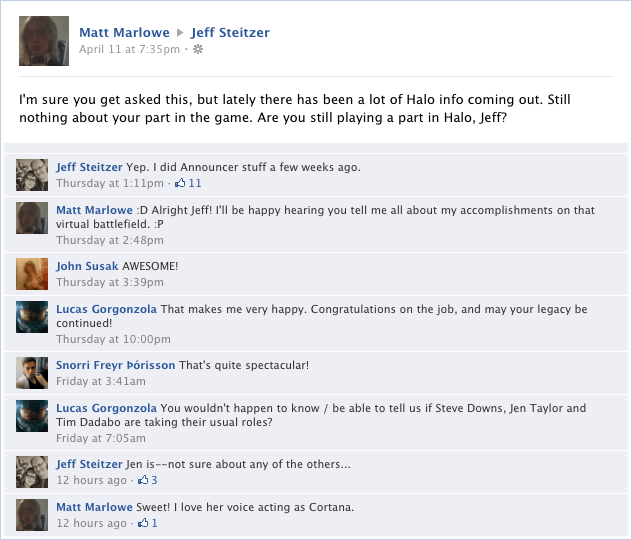 Jen Taylor, voicing the AI Cortana, and Jeff Steitzer, the multiplayer and firefight Announcer, confirmed on Facebook that they would again be reprising their roles for Halo 4. Steve Downes, the iconic voice of John-117, was confirmed to voice the game's protagonist in the June 9th Halo Bulletin. For the first time in the Halo series, Taylor and Downes recorded the dialog for some of their scenes together in the same voicing booth, whereas previously they had not even met in person. On the April 17th, 2012 episode of the TBS late night comedy show Conan, hosts Conan O'Brien and Andy Richter announced that they'll be voicing Navy deckhands aboard the advanced warship Infinity. Frank O'Connor, replying to a fan's question at the Rooster Teeth Expo, stated that the cast for the episodic cooperative series Spartan Ops would have the "biggest injection" of new voice talent for Halo 4. On April 11, 2012, the composer for Halo 4 was announced to be Neil Davidge, best known as the co-writer and producer for the British electronica duo Massive Attack. Davidge first started in his role as the future composer in late 2010, eventually having his first meeting with 343i laying out his ideas for the music of the game. After the meeting, Davidge began writing 20 to 30 pieces that would be the base of the Halo 4 score, which he officially began working on in August of 2011. Davidge has since stated that over four hours and an estimated 300 pieces had been written as of May 8, 2012. Composing Halo 4 is noted as being split into four distinct "tiers," each consisting of central themes for a handful of missions. Kazuma Jinnouchi composed a number of additional tracks for the game. Many of the key compositions were recorded and completed in January 2012 ahead of 343i's completion deadline. Though still grounded in the Halo universe, the score for Halo 4 takes a new direction from Martin O'Donnell's composition in previous Halo titles. Orchestral and composition for the score was done at the famed Abbey Road Studios in Westminster, London, England, mostly notably known for their work with The Beatles during the 1960s. The competitive and cooperative multiplayer modes of Halo 4 are grouped together into a mode known as Infinity, which is tied to the Halo series fiction and runs parallel to the campaign story. In Infinity, players take control of SPARTAN-IV supersoldiers serving aboard the advanced warship, UNSC Infinity. Prior to the beginning of development on Halo 4, 343i General Manager Bonnie Ross and Frank O'Connor set the framework of the new studio's mission which entailed that all pieces of existing and future fiction from the games, novels, comics, etc. would be interwoven and share content from each other. Among this would be the multiplayer component for Halo 4, which would later include the introduction of Spartan Ops; " Wrapping the whole thing together allowed us to make sure that all the fiction in all of those pieces actually mattered – in this case, it connects directly to your career as well as the narrative experience." Competitive multiplayer, known as "War Games," pits players against one another in adversarial combat training in simulated environments in the advanced combat deck of the Infinity. However, due to the emphasis on the SPARTAN-IV commandos, players do not have the option to use Sangheili for their multiplayer character. 343 Industries aimed to provide a "brand new experience" in Halo 4 multiplayer. This includes a reworking of the series' traditional balance system. For example, the player progression system is more extensive, allowing players to choose between various modifications which have an effect on gameplay, in addition to aesthetic armor permutations similar to the prior games. Players are able to customize their loadouts, being able to choose between various armor abilities as well as new customizable features, known as Support Upgrades and Tactical Packages. Tactical Packages offer a small performance boost to a chosen gameplay feature, such as the player's shield or weapon carrying capacity. Support Upgrades function similarly, and feature such improvements as motion tracker upgrade and an increase in the player's maximum ammunition. Halo 4 also introduces a new gameplay enhancement feature referred to as "Specializations". Specializations unlock different armor sets, emblems, visor colors, weapon and armor skins, and armor mods, which work similar to tactical packages and support upgrades. 343 Industries has described Halo 4's multiplayer gameplay as "much more fast-paced, more intense and visceral" than in the prior games. Weapon pickups on maps are marked on the player's heads-up display, and players are able to call in ordnance drops, containing power-ups or weapons, during War Games or Spartan Ops matches. Some multiplayer gametypes include Slayer, Infinity Slayer, and Regicide. Power-ups available in Infinity Slayer include Overshield, Damage Boost, and Speed Boost. Unlike Halo: Reach, where the original multiplayer maps were shared in the campaign as gameplay spaces, all multiplayer maps in Halo 4 were purpose-built for multiplayer alone much like in the first three Halo games (although some multiplayer maps are featured in Spartan Ops). 343 Industries collaborated with Certain Affinity in the production of the multiplayer maps for Halo 4. The player can only choose from a standard Spartan model. There are several armor permutations which can be combined. All armor permutations do not have any effects on gameplay. They are unlocked by achieving ranks and commendations. Spartan Ops is a secondary campaign that replaces the Firefight mode featured in Halo 3: ODST and Halo: Reach. Much like traditional campaign cooperative play, Spartan Ops allows up to four players to participate in weekly objective-based episodic missions. Missions intertwine directly with events in the main Halo 4 campaign, expanding on the story of the UNSC Infinity and her crew; this new mode is being likened to a second full-scale campaign for the game. Compared to a season of a television program, each "episode" of Spartan Ops features a pre-rendered cinematic and five playable missions complete with new events, characters, locations, and gameplay challenges, totaling up to 12 hours of new gameplay. The development of Spartan Ops saw the largest influx of new characters, along with corresponding facial and voice talent, and gameplay/sandbox elements into any property of the Halo franchise since 2001. 343 Industries will be supporting additional Spartan Ops missions for months after launch of the game and unlike Reach challenges, players have the opportunity to play from the beginning of the episodic campaign regardless of when they started playing. The first "season" is included with the price of the game, though 343i has not ruled out charging players for additional Spartan Ops seasons. Frank O'Connor has stated that Spartan Ops will "bridge the gap" between the events of Halo 4 and the future release of its sequel. The development of Spartan Ops came to fruition under the ideals of persistent, fresh replayability and small additions to the fiction surrounding the Reclaimer Trilogy and ancillary content. Each episode of the series, gameplay-wise, was meant to enhance the significance of the events the player is experiencing, and as such, simplistic single-objective missions were not a focus of Spartan Ops. Frank O'Connor in an interview with The Guardian states that the stories and events have been loosely laid out for "a few years"; the success or failure of Spartan Ops may lead to a continuation of the series past 2012-2013 with a "known beginning, a middle, and an end." The first season of Spartan Ops as of June 2012 was noted as being "very rigid" with the direction of the story having already been mapped out from beginning to end. There are currently no plans for a second season of Spartan Ops. However, Frank O'Connor has stated that "the story of Crimson, the Infinity and those characters and events is far from over". The story of the cast of characters from Spartan Ops is continued in the comic series Halo: Escalation. Season One consists of ten episodes and a total of fifty missions (five missions per episode) and was released following the launch of Halo 4. The first half of Season One was released between launch day, November 6, 2012, and December 3, 2012. The second half of the season was launched on January 21, 2013, and concluded the season on February 18, 2013. Forge is a returning feature in Halo 4. Co-developed with Certain Affinity, the feature was first shown to public audiences at the Rooster Teeth Expo on July 7, 2012 in a presentation highlighting various new features included with this newest iteration of Forge mode. The feature sports a number of improvements over its predecessors, including the ability to use "magnets" to snap objects to one another or duplicate any object at will. It is accessible in four dedicated maps with unique object palettes. Marketing for Halo 4 began in June 2012 with the release of the live-action trailer The Commissioning at E3 2012. The short live-action trailer simultaneously depicts the ceremony that formally placed the UNSC Infinity in active duty within the Fleet, during operations in deep space with its battlegroup, and eventually during the Promethean's assault on its systems, dragging it into the shield world of Requiem. To go along with the live-action trailer, Xbox.com updated its Halo 4 page, putting the user in the command room right after the crash. Other advertisements also include "Scanned", a launch trailer produced by film director David Fincher and the Official Launch Gameplay Trailer. Scanned is a two-minute teaser to the game that seamlessly blends computer-generated and live action imagery, developing on the history of the character of John-117 as his adversary, the Didact, scans his memories. The public had their first opportunity to play Halo 4 War Games at the Rooster Teeth Expo in Austin, Texas on July 7–8, 2012. The North American (ESRB) and European (PEGI) cover art for Halo 4, seen here, was unveiled on May 14, 2012 through a series of 32 "puzzle pieces" given to various community members by 343 Industries. It depicts John-117 kneeling in his upgraded MJOLNIR armor with an MA5D assault rifle at the entrance to the Requiem Dyson sphere. To his sides, the crashing remains of the UNSC Forward Unto Dawn, which is visually upgraded from its previous incarnation in Halo 3, and a CCS-class battlecruiser with other debris surround him. Announced on May 16, 2012, 343 Industries revealed a collector's edition for Halo 4. The Halo 4 Limited Edition has been noted as "maximizing your multiplayer experience," which in turn expands on the fiction of the Halo universe like many aspects of the game as a whole. The Limited Edition is presented in a large, minimalistic grey case that is adorned with an updated United Nations Space Command insignia; the game itself is included in a smaller silver tin case that features similar artwork to the larger case and is embossed with futuristic artwork. It is currently available for purchase worldwide starting at $99.99 (USD). 343 Industries has confirmed that there will not be a "Legendary Edition" for Halo 4, citing that they didn't want consumers to have to choose what version-specific ancillary items they would receive. 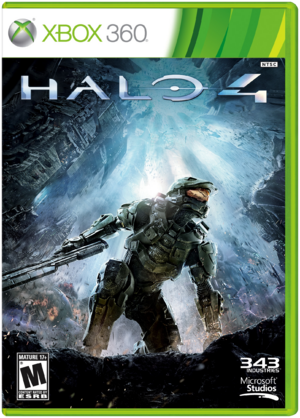 On August 26, 2013, IGN revealed a Game of the Year Edition for Halo 4. The Game of the Year Edition includes the 3 DLCs that came with the War Games Season Pass (Crimson, Majestic and Castle), the Champions Bundle, Spartan Ops Season 1, and several digital preorder and limited edition bonuses. It is available at $49.99 (USD), and it was released on October 8, 2013. ↑ Includes EBGames Canada, Gamestop Germany, Gamestop Italy, Gamestop Spain. Awakening: The Art of Halo 4 is a hardcover art book first announced on May 8, 2012. The book was published by Titan Books with a release date of November 2, 2012. This fourth retail art collection from the Halo universe includes 192 pages of colored illustration used during production to create the vision of Halo 4 as well as commentary by 343 Industries artists and developers. Five novels released from January 2011 to January 2014, though not specifically game merchandise, are intertwined with the story and expanded universe introduced in Halo 4. Set thousands of years in the past, the Forerunner Saga and its three novels Cryptum (Jan. 4, 2011), Primordium (Jan. 3, 2012), and Silentium (Jan. 8, 2013 ) deal with the events leading up to and during the Forerunner-Flood war up to the "present day." The Kilo-Five Trilogy, consisting of Glasslands (Oct. 25, 2011), The Thursday War (Oct. 2nd, 2012), and Mortal Dictata (Jan. 21, 2014), chronicles the months following the end of Halo 3 and bridges the gap between the original Bungie trilogy and the Reclaimer Saga. Halo 4: The Essential Visual Guide is a visual guidebook released on September 16, 2013 in the US. The guide was published by Dorling Kindersley and contains 232 pages of images and information on the locations, characters, creatures, vehicles, and weapons featured in Halo 4. McFarlane Toys announced three waves of action figures, vehicles, toy sets, and other products for Halo 4. The first series, released in August 2012, featured four 6-inch carded figures, which include returning characters John-117 and a Sangheili Zealot and two new inclusions into the Halo universe, the Unggoy Storm and two Spartan Warriors, one red and one blue; a larger boxed product, featuring an up-scaled John-117 and accessories within a frozen cryopod is also available. Released alongside Halo 4 in November was the second series, including a figure of Cortana and a SPARTAN-IV soldier with two new enemy types, the Crawler and the Watcher; another large boxed product, featuring a Promethean Knight, was released in Holiday 2012. The second series, released in October 2013, featured four 6-inch as John-117 with the ARC-920, tree Spartan Warriors (orange, purple and steeel/green), a Sangheili Ranger with the T-27 Beam Rifle and one new inclusion: the Kig-Yar Storm with the Covenant Carbine; a larger boxed product, featuring an up-scaled Ur-Didact with a removable helmet was also available. All the figures of series 2 included a code for Halo 4's Infinity mode. The third series, which will be released on February 2015, will feature three figures: Jul 'Mdama with an energy sword, Gabriel Thorne with an MA5D assault rifle, and Sarah Palmer with two M6H magnums. McFarlane also released a Halo 4 series under their "Micro Ops" line, which includes smaller non-character figures made specifically for battle recreations. Jada Toys produced replica figures and die cast vehicles based on content from the game, including a highly detailed 14-inch M12 Warthog vehicle. Mad Catz Interactive, Inc., a well known manufacturing company for game products, released a licensed communication headset coinciding with the launch of Halo 4. The headset's aesthetics has a design reminiscent of designs seen in the Halo universe. GAEMS PGE, manufacturer of personal gaming environments, produced a UNSC-themed Personal Gaming Environment for the Xbox 360. Called "Awakening," this trailer was revealed for the first time on June 6, 2011 at E3 2011, during the Xbox Press Briefing in Los Angeles, California. It effectively was the announcement of Halo 4 as well of that of the Reclaimer Saga (originally called Reclaimer Trilogy). Developed by agencytwofifteen, Digital Domain, and Anonymous Content, with music by the game's composer Neil Davidge, Awakening showed off early assets currently in-development by 343 Industries including John-117's new armor and Cortana's makeover since their last incarnations in Halo 3 and the animated short film Halo Legends: Origins. It would later be revealed that the trailer is set during the opening moments of Halo 4, during a Covenant boarding of the ship. Aptly named, the trailer depicts the awakening of John-117 from cryo sleep aboard the UNSC Forward Unto Dawn by Cortana shouting for the Spartan to wake up. John-117 secures Cortana's data crystal within his neural interface and proceeds to escape a raging fire engulfing him while dodging broken-off debris from the ship. Blasting open a door preventing his escape, John-117 lays his eyes on the outer surface of an unknown alien world. Standing on the very edge of the warship being torn apart by explosions, the Spartan and his AI companion view this world opening itself. Ending off the 10-year anniversary celebration of Halo Fest at PAX Prime 2011 in Seattle, Washington was the release of a trailer following the first panel discussing Halo 4. Released on August 28, 2011, it would be the first new glimpse of the game since its reveal at E3. It featured glimpses at many of the upcoming campaign's environments, including a terrestrial world with Forerunner glyphs on the surface, several location drafts which feature distinctly Forerunner buildings and ships, concepts of the Forward Unto Dawn's wreckage, and some concepts of the then-unidentified Requiem. Two of these images were repurposed as the cover art for the Forerunner Saga novels, Cryptum and Primordium. Following the Halo 4 title card was a quick teaser of an early iteration of the Promethean Knight. Making Halo 4 is a documentary series covering the development of Halo 4, presented and narrated by the staff of 343 Industries. A total of seven videos were released under this documentary series. The first video, titled "First Look", revealed the first in-game footage of Campaign and War Games for Halo 4 along with various gameplay elements. Composing Worlds is the second video, focusing on the audio design of the development. The third video, titled "A Hero Awakens", goes in great detail on the development of storyline and character performances. The fourth video, titled "Return of the Forerunners", focuses on the development of the Prometheans and their weapons. The fifth, titled "Infinity Multiplayer", focuses on the development and inspiration of Halo 4's multiplayer mode. The sixth video, titled "Majestic Map Pack", focused on the development of the Majestic Map Pack. The seventh and last video, titled "Spartan Ops: Season 1", focused on the development of the Spartan Ops mode. Nearly a year after the announcement of the game, 343 Industries revealed the first proper gameplay footage of Halo 4 on June 4, 2012 at the Xbox Press Briefing for E3 2012. Headlining the show, the demonstration started off with the first viewing of the live-action trailer The Commissioning which synced perfectly into the events of the in-game portion of the reveal. The UNSC Infinity, pulled down into the atmosphere of Requiem by the Prometheans, flies right above John-117 who determines that the advanced warship will crash nearly 78 kilometers from their position. This gameplay demonstration reveals the "ancient evil" that John-117 and his companions will fight during the course of the game, who would be revealed as the Prometheans, the ultimate group of the Forerunner Warrior-Servant caste. 343i's reveal concludes with a short cinematic montage of various environments across Requiem with a voiceover sequence by Cortana, revealing the first prominent display of Rampancy in the series. 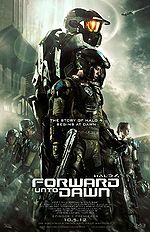 Announced on April 30, 2012, Halo 4: Forward Unto Dawn is a five-episode live-action series with a total runtime of 75 minutes, making it one of the longest marketing programs for any game in history. Forward Unto Dawn chronicles the life of Thomas Lasky from his experiences at Corbulo Academy decades before his service aboard the UNSC Infinity, alongside his "mentor" John-117. 343i's business director, Matt McCloskey, stated that Forward Unto Dawn would allow the franchise to "make Halo accessible for people who haven't played the games." Both McCloskey and Frank O'Connor noted that the series would flesh out the fiction of the universe, particularly Halo 4's. Viewers are given background information on the various events set prior to the game and the characters set to appear in it, as well as being introduced to new elements and expanding on old ones. Forward Unto Dawn was released prior to the worldwide launch of Halo 4 on October 5, 2012, first as a short weekly webseries exclusively on Halo Waypoint and Machinima.com and later in its full 75-minute form on other devices. A 90-minute extended edition is included with the limited edition for Halo 4. Directed by Stewart Hendler, filming on Forward Unto Dawn took place in British Columbia throughout Spring 2012 and is currently in post-production in Los Angeles. It stars Tom Green (Thomas Lasky), Anna Popplewell (Chyler Silva), and Daniel Cudmore (John-117). The Halo 4: Original Soundtrack was released on October 22, 2012. The soundtrack features 15 tracks, though some editions come with a remix album. Halo 4 has received extremely positive acclaim from critics, and high praise for surpassing expectations. IGN's Ryan McCaffrey gave the game a score of 9.8 out of 10, calling it "not only a success, but a bar-raising triumph for the entire first-person shooter genre," and praised most aspects of the game, ranging from graphics and design to enemy behaviour, and called the multiplayer "golden". Criticisms of the game were that the need to view the Terminal through Halo Waypoint "serves only to pull you out of the experience, literally and figuratively. ", and that "some of its fetch quest-y, flip-three-switches sequences feel like they artificially lengthen the game because of how long you can get hung up on them when the going gets tough." 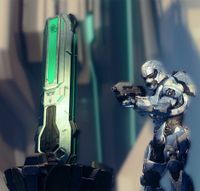 The only negative of multiplayer was that the Spartan Ops mode "lacks the replayability and score-based incentives of the Firefight mode it replaces," and that the new lobby system was "a bit more cluttered and difficult to parse through than previous Halos," but otherwise praised it as "on par with what Bungie had previously established." His overall conclusion was that "Halo has been rebuilt. It has been redefined. And it has been reinvigorated." Jose Otero of 1UP similarly praised the game, stating that 343 Industries have "created a worthy sequel to a blockbuster franchise that wasn't initially theirs,", and that "Halo 4 demonstrates a genuine effort to either introduce new elements or simply correct old problems." He also stated that "the sound design of Halo 4 benefits from having a punchier effect than the previous entries," and that the game "benefits from striking art direction that draws some inspiration from J.J. Abrams' 2009 Star Trek while adding an impressive layer of detail." Criticism of the campaign was that while "For the most part, the narrative does well at weaving together a big-picture conflict involving the mysterious Forerunners while telling a subtle side story about Cortana's descent into rampancy", "the resolution to Halo 4's story doesn't make a lot of sense." He admitted that "the decision to adopt a perks system in Halo 4 makes sense from a gameplay perspective, since it introduces additional avenues for players to build a character that fits their distinct play style, but these same additions slightly erase elements that distinguish two of the biggest shooter franchises from one other. Halo still has the advantage of energy shields and armor abilities, but it's a shame to see the series conform to another game's mold", and he voiced concerns that "the short length of Spartan Ops can feel odd at first -- unless you're playing on Legendary difficulty, that is -- but the promise of more content could easily erase these concerns." He praised the addition of the Prometheans, which "add a wonderful element of enemy teamwork that complements the existing A.I. behaviors beautifully," and concluded that "343i has done a great job of capturing the essence of Halo, tapping into the kind of options that FPS fans love." Tina Amini praised the emotional impact of the campaign, stating that "I can safely say I’ve never sat through a Halo campaign quite at the edge of my seat like I have in the first title by 343 Industries,", and praised the campaign as "beautiful. It’s cinematic, and features lovely music," and that it "humanized what was up until now mainly just a really fun, well-made series of games," though she found that "concepts and names are thrown at you in such rapid succession that it’s difficult to follow along" and complained that "I found the Spartan Ops missions to be fairly boring." She also admitted that "gamers are afraid of change. So the addition of ordnance drops in multiplayer—basically a bonus given to players who do well during a match—might not be desirable." She also complained that "Prometheans as a new enemy class are more annoying than I expected," and that "fighting them grew stale very quickly," but praised their arsenal as "trump[ing] even the Covenant’s stock." Overall, she recommended that players "keep an open mind for Halo 4, because you just may enjoy it as much as I did." Despite the well-received sales figures and positive reviews, social networking site Raptr reported that Halo 4's player population declined rapidly since its release, even worse when compared to Halo: Reach. When recording dialogue as Sergeant Major Avery Johnson for Halo 2, David Scully humorously said, "In Halo 4, I get a woman!" The four Covenant species featured in Halo 4 are the same as those featured in Halo: Combat Evolved: Elites, Jackals, Grunts, and Hunters. In Spartan Ops' pre-rendered cutscenes, some weapons use models from older builds of the game as seen in early in-game screenshots. For example, the BR85HB SR is erroneously labeled as the BR55HB SR and the M395 Designated Marksman Rifle lacks a front sight. Promotional image of Master Chief. Full game cover for Halo 4. North American/ESRB cover art without Xbox 360 branding. Released May 14, 2012. High resolution covert art poster. Animated video of the Halo 4 cover. A promotional image for Halo 4, depicting the wreckage of the Forward Unto Dawn descending toward Requiem. Early promotional art of John-117 in Halo 4. John-117 holding an MA5D assault rifle. A poster that came with pre-orders from Best Buy. An Ancient Evil awakens wallpaper made to promote the game. A lithograph made to promote Halo 4 in 2013. The pre-release main menu of Halo 4. The HUD utilized in Halo 4's single-player. John-117 in a cryo chamber. John-117 and a Sangheili Storm in a close quarters fight. Covenant troops are killed by an explosion. The Chief watches as the UNSC Infinity crash-lands. A swarm of Phantoms and Banshees close in on the crashed Infinity. John-117 alongside UNSC troops in a dropship bay. Master Chief in a desert environment on Requiem. The HUD utilized in Halo 4's multiplayer on the map Haven. A Cyclops Mark II under construction in a UNSC factory in the multiplayer map Adrift. A screenshot from the game's Infinity mode. Two opposing Spartans fight, with one wielding a scattershot. Alert carry in Halo 4. A sword-wielding Spartan engages a Promethean Knight. Two Spartans attack a hard-shielded Knight, guarded by two Watchers. Two Spartans facing a swarm of Promethean hostiles. A Spartan prepares to stab a Knight with his combat knife. A view of the walkway at a Forerunner facility. A pair of spires at the facility. A wide view of the walkway. Note the lava flowing beneath the bridge. A general view of Requiem. The wreckage of the Forward Unto Dawn entering an iris-like opening on Requiem. Forward Unto Dawn concept art. Concept art of a landscape on Requiem. A view of Requiems spires. Another view of Requiems spires. UNSC ships entering the structure through what appears to be the same or similar opening. Concept art of a Forerunner gravity field generator. A valley with massive Forerunner towers suspended in the air. Concept art of the Forerunner skyscrapers that serves as the setting for Haven. Concept art of a Pelican landing at the orbital manufacturing facility that serves as the setting for Adrift. Concept art of the prototype warship UNSC Infinity. A compilation of screen captures from the end of the concept art trailer, depicting an early version of a Promethean Knight. Concept art of Master Chief and Cortana. Concept art of the Forward Unto Dawn's cryo bay. Concept art of a Forerunner artifact in a UNSC facility. Spaceships concept art, later used as the cover art for Halo: Primordium. Concept art of the finale. Concept art of a Forerunner building. Concept art of an unrealised remake of Narrows from Halo 3. Concept art of the cut Narrows remake..
↑ Artstation: Halo 4 - vehicles - concept art bears the logo "Halo Onyx". ↑ halo.bungie.org: Re: Who's the writer for Halo 4? ↑ 53.0 53.1 53.2 Guardian.co.uk: Halo 4 multiplayer revealed: Master Chief meets Call of Duty? ↑ 59.0 59.1 Little English Halo Blog: New Halo 4 Info Blowout via ExpertZone! ↑ Rooster Teeth: Play Halo 4 at RTX! ↑ 67.0 67.1 halo.bungie.org: Halo 4 Puzzle Email? ↑ Halo Waypoint: MCFARLANE TOYS BRINGS THE NEXT HALO GAME TO LIFE WITH HALO 4 ACTION FIGURES! ↑ McFarlane:MCFARLANE TOYS ANNOUNCES SECOND SERIES OF ‘HALO 4’ ACTION FIGURES! ↑ 86.0 86.1 86.2 86.3 86.4 86.5 86.6 86.7 86.8 86.9 Jose Otero, "Halo 4 Review: Laying the Groundwork for a New Trilogy, 1UP"
↑ Tina Amini, "Halo 4: The Kotaku Review"